Patra's Other Place: A very Happy Birthday! We had dinner out that night with our friends Mark and Louise, who celebrate their wedding anniversary on the same day as my birthday, so we usually go out together on the night. 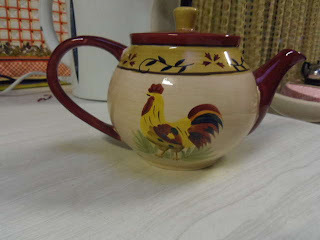 They presented me with a gift at the table while we were waiting for our meal...the very teapot I'd asked Ken for! What an amazing coincidence, NOT! Louise knew I wanted it, and had planned to get it for me, but Ken didn't know that, and was going to include it with the dinner set. 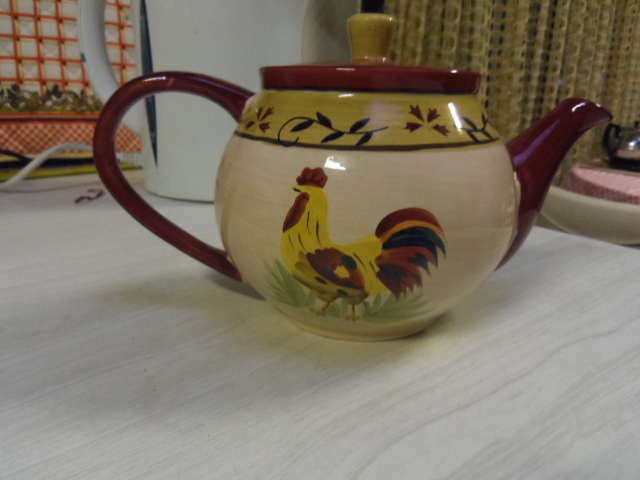 Luckily they happened to meet at the gift shop (and that was a coincidence) and were able to sort out their purchases, otherwise I would have ended up with two teapots! 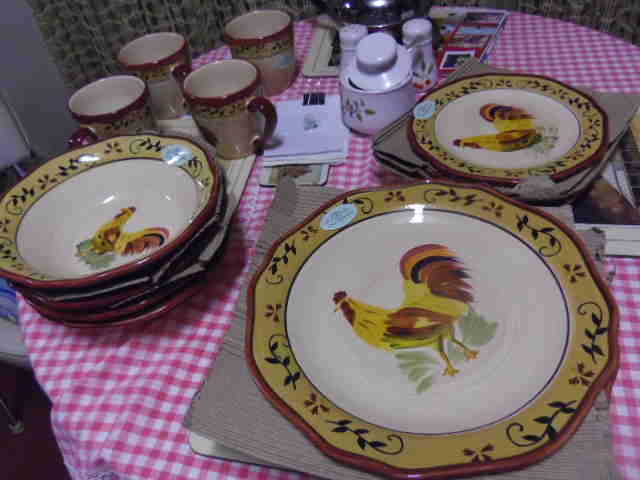 I now have to get rid of one dinner set - probably the Noritake set because we've had that for over ten years and it was second hand when we got it. My day was just as much fun as the evening. I had lunch with two dear friends, who gave me lovely gifts. 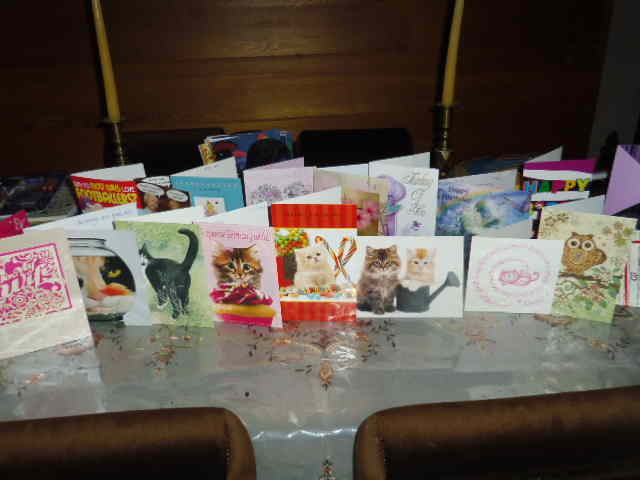 There were also gifts that had arrived earlier that week, waiting to be opened, as well as lots of lovely cards. 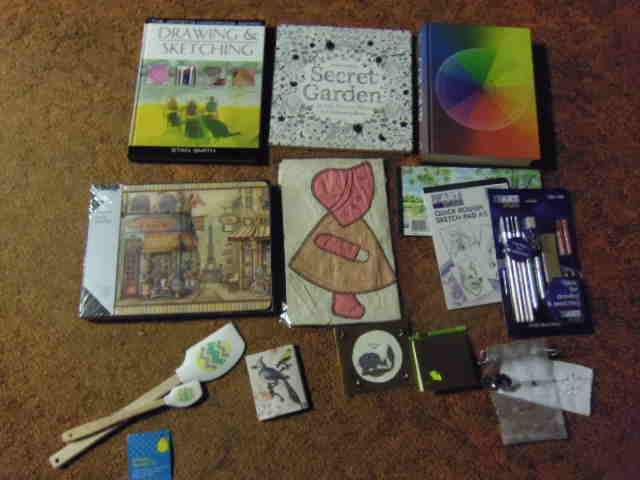 Three books - all art related, two sketching pads and pack of artist pencils etc., placemats, vintage patchwork, arty spatula set, little notebooks, crystal pendant, and the cutest cross stitch. I would say your man loves you a lot! I'm a little late, but this is my Birthday wish for you . . . many, many more and each year more enjoyable. I was hoping my stuff would have arrived in time for your bday. 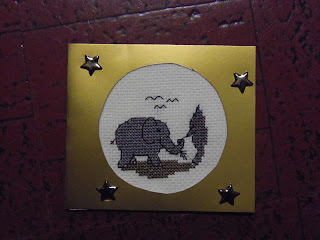 I found out hubby forgot to mail it. It is at the office but hes out of town. Im sorry. Hope you had a great day. Happy Birthday! What a lovely man! Happy belated birthday. Sounds like you had a very nice one. Ken's gift was wonderful and he is just showing you how much he does appreciate you and all your help. Sometimes it is hard fo someone to say it so they show it with something nice.